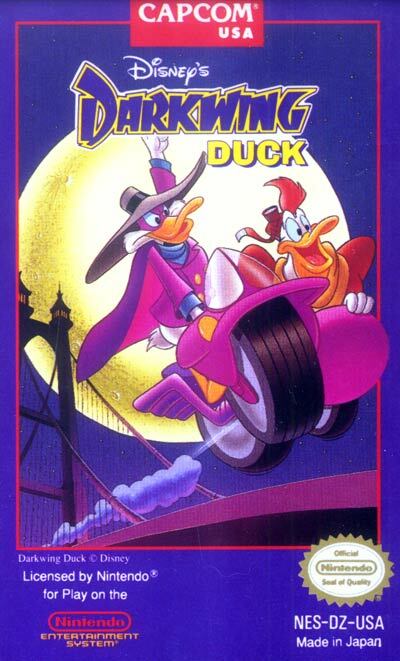 Darkwing Duck has to save his hometown of St. Canard from seven different villains. The game plays very much like Capcom's Mega Man video game series, with lots of jumping and shooting and the ability to change weapons via a subscreen; the game is actually running on a slightly tweaked Mega Man 5 engine. However, the game did not have a password feature, and thus was often cited by video game critics as being too difficult for younger players. Darkwing starts out with a weak gas gun that only stuns most enemies, but can collect more powerful weapons in the game. Darkwing can also deflect certain enemy projectives by using his cape.